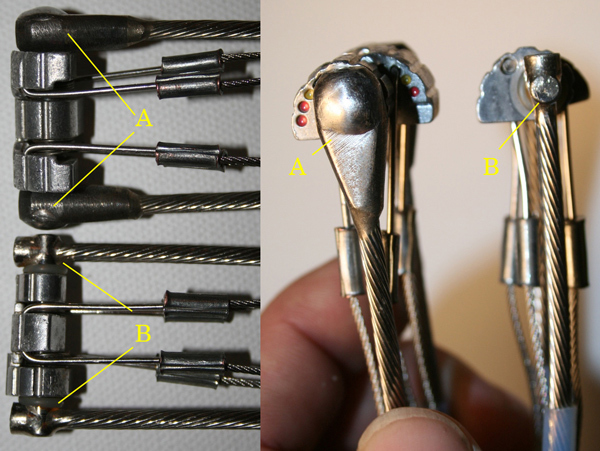 As you can see in Figure 1, the collar on the Ultralight Offset ( indicated by “B”) has been redesigned, making a much smaller placement profile and also lightening the TCU significantly when compared to the older TCU design (indicated by “A”). This Direct Axle Technology is also available in the Metolius standard TCUs, Powercams, Fatcams, and Supercams. When you start to add up the weight of a full or double rack, these cams can save you quite a bit of weight. The Offset TCUs also feature a 13mm dyneema sling, color coded so you can differentiate them from standard TCUs. Also, the tubing on the “U” shaped end of the TCU has color coded tubing. The lobes are constructed of 7075-T6 aluminum.